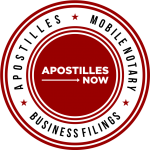 We will review your documents in advance to make sure they will qualify for an apostille, free! We appreciate the opportunity to work with you! We'll be in touch shortly. Here's our email and mailing address. We check both everyday, and will get back to you within 24 hours. What's the best phone number to call you once we receive your docs? Okay, what's the best phone # for you? We will review your document(s) and reply to you within 1 business day. We appreciate the opportunity to work with you. We'll be in touch shortly. Can’t I file my own Apostille Documents? Sure, but why? If what you need is important enough to require an Apostille, it’s important enough to have it done correctly the first time, on time and guaranteed by the professionals. We cover all the state fees! An Apostille is a means by which to authenticate documents for use in foreign countries. What is the difference between a certificate and an Apostille? None, anymore. As of Jan 1, 2017, The California Secretary of State only issues Apostilles. If you are shopping around for the best service to get your Apostille done, and the website lists all the Hague Convention countries, they are not up to date on the latest official procedures at the SOS. What officials are authorized to sign my document before it is eligible to get an apostille?